I made rice pudding the other day, and bought a new box of arborio rice for it. But obviously, because I’m an idiot and I forgot to check my cupboards beforehand, I already had a full box in the kitchen. Risotto was definitely on the cards! 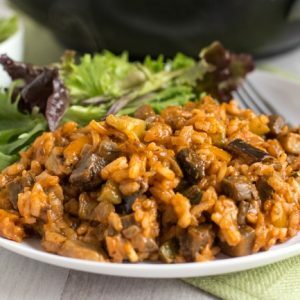 You can make risotto in just about any flavour you can think of – this time I made ratatouille risotto, chock-full of veggies. Risotto is really easy to make. I think it sometimes has a bad reputation for being labour intensive and taking a long time, but really it’s pretty straightforward. Sure, it does take a little while to get the rice nice and soft and creamy, but you don’t actually have to stir constantly if you have something better to do (it’s probably some kind of cooking blasphemy to say that, but really, who’s got the time – or stamina – to stir non-stop for 40 minutes? Just stirring every few minutes while you potter around in the kitchen is totally fine). 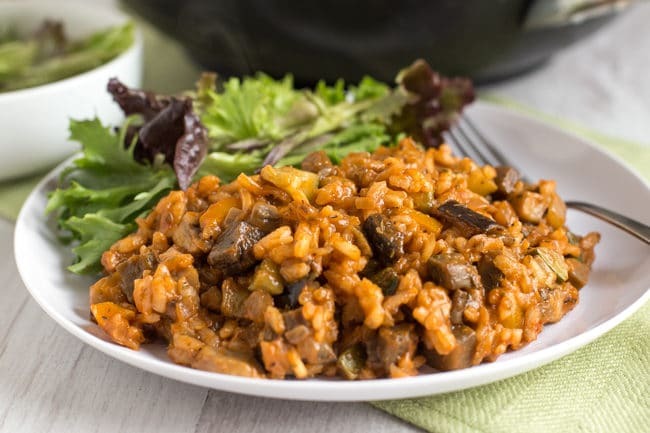 This ratatouille risotto starts with aubergine (eggplant), courgette (zucchini), mushrooms, and peppers, all cooked up together with a whoops-my-hand-slipped amount of oregano, and plenty of garlic for good measure. I could pretty much just eat the vegetable mixture on its own, but it’s even better if you resist long enough to add the rich, tomatoey rice. I usually add a good handful of grated cheese to my risotto, but continuing with my aim to not always add cheese to everything (just most things), I decided to keep my risotto vegan this time. 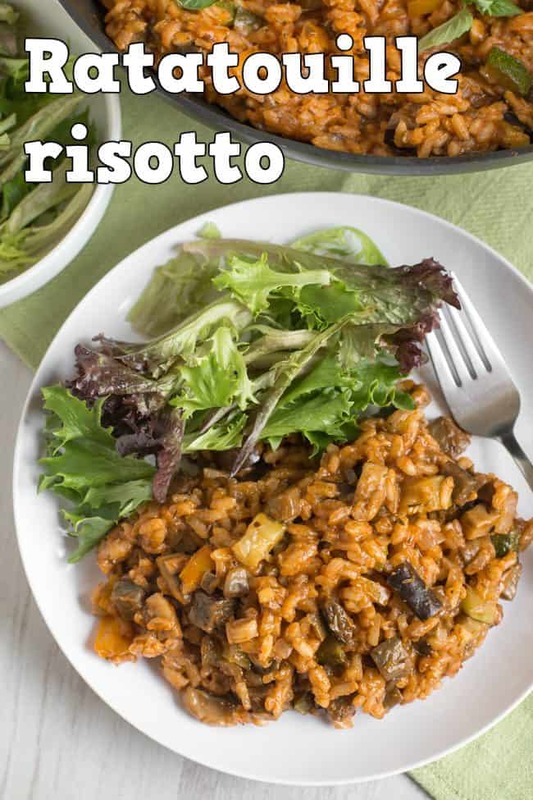 You can definitely add some cheese if you like, but arborio rice gets nice and creamy on its own anyway, so it’s not vital. 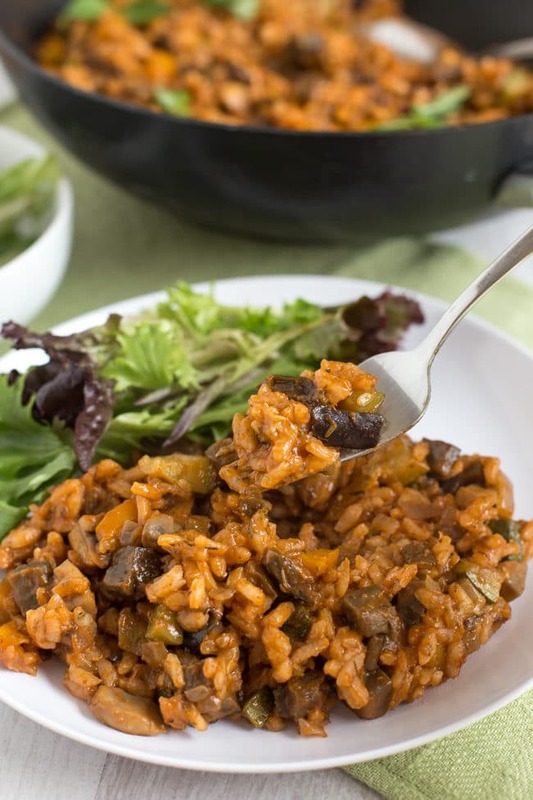 The veggies, tomato puree and a dollop of pesto make this ratatouille risotto plenty rich enough without it. 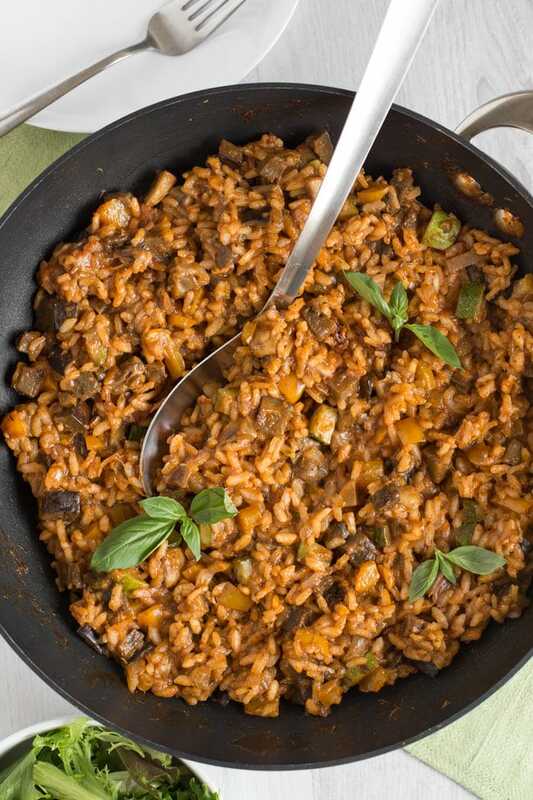 Heat 1 tbsp oil in a large frying pan or wok, and add the diced onion, aubergine, pepper, courgette and mushrooms. Cook over a medium heat for around 10 minutes, stirring regularly, until the vegetables are soft and just starting to turn golden. Add the minced garlic and dried oregano, and cook for a couple more minutes. Remove the vegetables from the pan, and set aside. Add the remaining 1 tbsp oil to the same pan, and add the arborio rice (alternatively, if you prefer, you can use a separate pan for the rice and cook both simultaneously). Cook the rice in the oil for a minute or two over a medium-low heat, stirring constantly, then add a little of the vegetable stock. Stirring regularly, allow the rice to absorb most of the excess liquid. Continue adding the stock a little at a time, allowing any excess to be absorbed each time before adding more. When you've used all the stock and the rice is soft, add the tomato puree, balsamic vinegar, and basil pesto, and mix well. Return the cooked vegetables to the pan, and mix well to combine. Serve topped with fresh basil if desired. Leftover risotto? 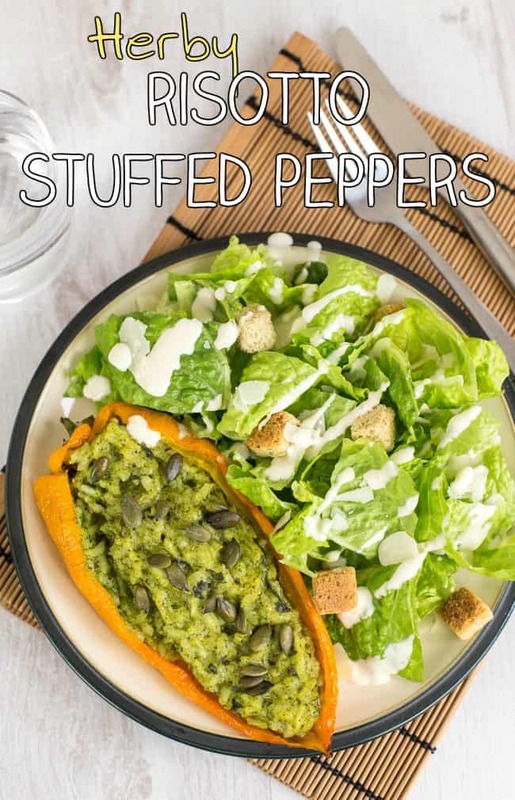 Use it to make risotto stuffed peppers! I just wanted to clarify what you mean by ‘tomato puree’. Tomato paste? 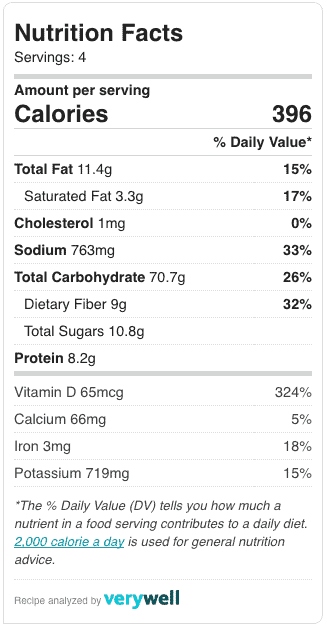 Tomato sauce from a can that has additional spices? Pomi brand tomato sauce from a carton that is nothing but tomatoes (no spices) which I conveniently have in my fridge? I do appreciate your help! Hi Erica :) I’m fairly sure that what we call tomato puree in the UK is the same as your tomato paste in the US – it comes in a tube or a small can, and is a fairly thick, rich tomato paste. It just serves to make the sauce a little richer :) Hope that helps! I absolutely loved this and I can’t wait to make it again! I actually forgot to put the onion in but it still tasted amazing. Thanks. I love risotto! It’s one of my go-to recipes when we’re travelling in our motor home, as it can be made in one pot, so less washing-up. I love ratatouille, too, so this sounds just about perfect. I would probably be the one stirring for 40 mins while listening to the radio and daydreaming… if the kids would leave me to it long enough! This sounds like exactly the sort of recipe I love – one that looks incredibly comforting but is actually pretty healthy. I’m making it for sure the next time I fancy rice. this sounds like a total comforting meal with veggies – perfect for dinner! I don’t stir my risottos the whole time they’re cooking either. It seems to work fine. I don’t put cheese in either, I usualky forget! Have you checked out Delia’s oven baked mushroom risotto? I think it’s in the WintervCooking book. I’m just too lazy to stir continually! It works just fine. I also add a whole stock cube at the start of the cooking process, and then just add more water straight from the kettle as I’m going along – much easier than keeping a jug of hot stock on hand! I haven’t seen Delia’s mushroom risotto but I do love an oven baked version! I use either Swiss Bouillon or Kallo stock powder with a pinch of saffron. I have a pan of stock simmering next to the risotto pan. I currently prefer the Kallo.